This printable game, called 101 and Out!, is a great way for kids to practise their place value skills by using a hundreds chart. Use addition, subtraction, multiplication and division to move from tile to tile and get to the end of this puzzle. Improve your fourth grader's maths addition skills and have him complete a fun coloring activity using one simple worksheet. Practise addition and subtraction while honing your logic skills. 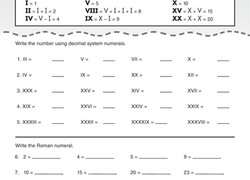 Fill in the missing blanks with the correct numbers to make each equation true.